I’m super pumped to be sharing this post for SO many reasons. But the biggest one might be that OUR KITCHEN IS ALMOST FINISHED!! I’m waiting until it’s all said and done to post photos of the whole shebang, you know, for a BIG REVEAL. I’m going to do it up right, with before and after pics and all that jazz. It’s exciting. I’m excited. Are you excited?! You should be. While there is still a lot of cosmetic work to be done, our kitchen has been fully functional for about a week now, and it’s been everything. My happiness level has skyrocketed. Joni Mitchell sang “you don’t know what you got ’till it’s gone,” and she wasn’t kidding. 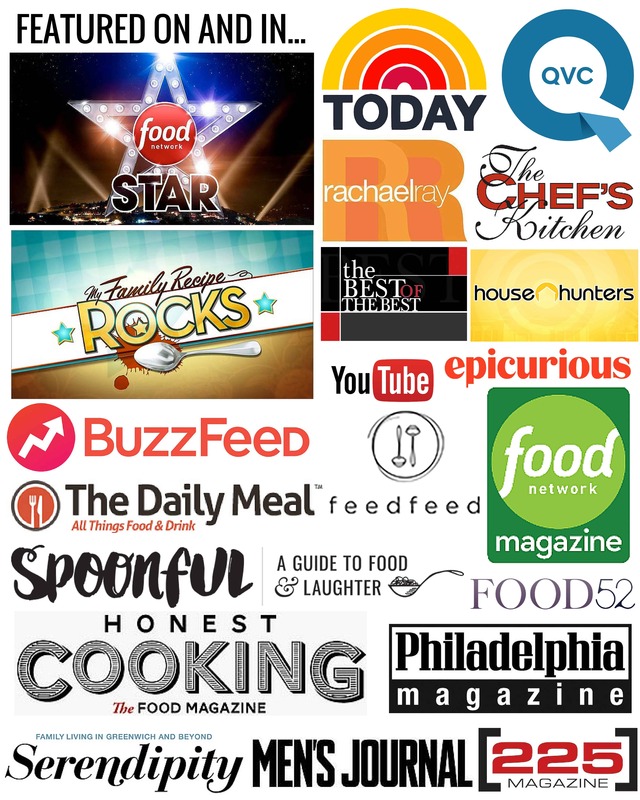 I didn’t realize how much not having a kitchen was affecting my quality of life. But it was all worth it – this kitchen is already something out of my dreams and it’s not even finished yet. You can catch a sneak peak in some of these photos – like our massive quartz counter tops and my new fancy stove! The other reason I’m excited about this post is because of this crazy crop of tomatillos I just harvested from my garden. This year has been by far the best growing season I’ve had since moving to this house. And since we’ve still yet have a proper frost two weeks into November, it’s meant a very long season too, which is always a good thing. But with temperatures plummeting, a frost will undoubtedly happen within the next few days. So I ventured out to gather up the last of the peppers, eggplant, green tomatoes (which WILL be fried and pickled! ), pumpkins, gourds, arugula, herbs and to my surprise, these beautiful emerald and amethyst gems! All summer long I watched as the vines grew like crazy , but they never yielded any fruit. When I checked the other day, I discovered a whole mess of tomatillos growing in the jungle! I love when my garden throws me curve balls like this. I did however get a nice crop all summer long of another variety called pineapple tomatillos. They are tiny, orangey-yellow, super sweet and complex in flavor – perfect for snacking! 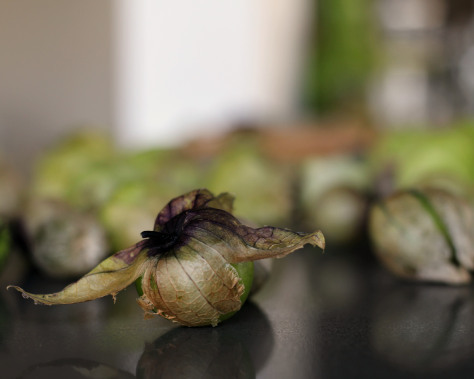 But these tomatillos, found traditionally in Mexican cuisine, are far too sour and astringent to eat raw on their own. They require a little cooking and fussing to bring out their best flavor. That’s where this salsa comes in. 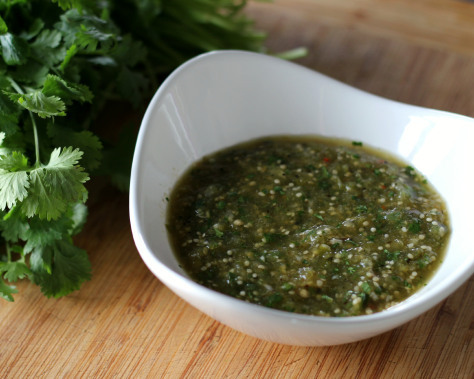 I love love love keeping different homemade salsas and hot sauces on hand all the time. You can turn any ordinary meal into something extraordinary by just spooning a dollop over the top. Like, for instance this open faced fried egg sandwich I made for breakfast. 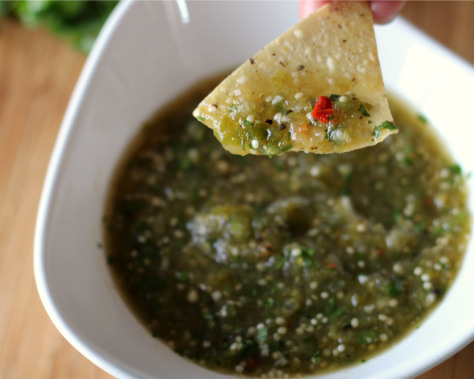 This salsa is perfect for lots of things: dipping chips, topping tacos, smothering enchiladas, or serving as a side to grilled meats and seafood. It comes together super fast, and will be gone before you know it. 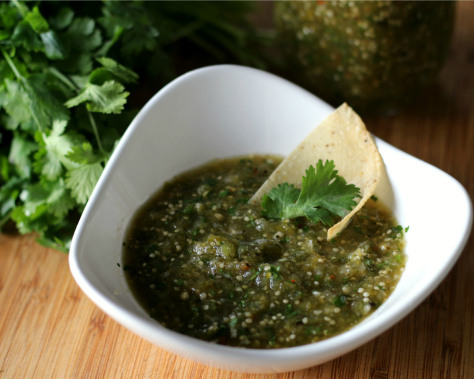 There are a lot of ways to make salsa, just like there are a lot of ways to skin a cat. But I wouldn’t know anything about that. Some are made by just throwing everything in a pot and letting it cook, and while that still produces a great salsa, I love the flavor that results from charring the vegetables prior to blending them all together. It gives a complexity and smokiness that you just can’t get any other way. Tomatillos are super easy to grow – the vines take off like weeds and a single plant can produce (as I’ve just discovered) quite a bit. But if you don’t have a garden, they’ve become pretty easy to find at the grocery store. Look for them in the produce section near the tomatoes or other Latin vegetables. They have papery husks surrounding fruit that looks like a bright green tomato, and are sticky to the touch when the husk is pulled back. 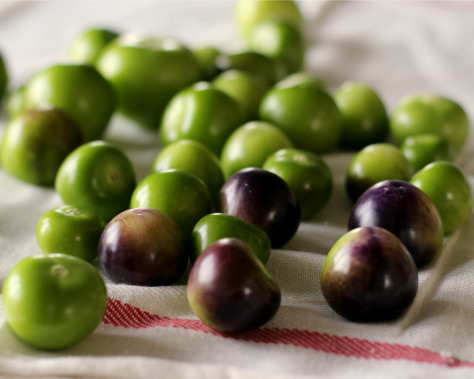 Pick tomatillos that are bright green and heavy for their size. Not finding them? Head over to your nearest Mexican market, and you’ll be sure to score. 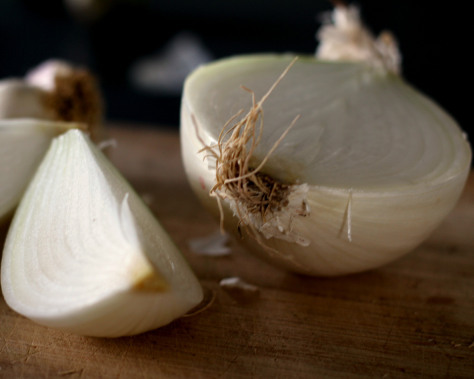 Use as a dip or condiment to spice up your favorite meal. Preheat a griddle, large cast iron skillet or comal over high heat. 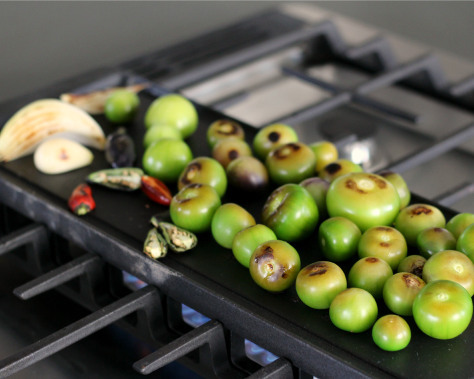 Place the tomatillos, peppers, onion and garlic on the griddle and let them sit a few minutes until they begin to char and blacken on the bottom. Turn the vegetables until they are charred on all sides and softened, about 10 minutes. Transfer the vegetables to a food processor along with the water and salt and pulse until you have a chunky consistency (add more water if it's too thick). Transfer to a bowl and stir in the remaining minced onion and cilantro. Keep refrigerated in a tightly sealed glass jar for up to a week. *Chiles vary greatly in the amount of heat they contain, even within the same variety. Serranos tend to be spicier than jalepenos, however the opposite can often be the case. I always like to split the chiles down the center in order to test their heat before using. Use a finger to tough the ribs and seeds of the pepper, and then lick your finger. If it immediately sets you on fire, then you know it's a hot one. To keep the salsa mild, be sure to remove the ribs and seeds before toasting. But if you like it spicy like me, go crazy. To make the awesome open-faced egg sandwich I spoke of earlier, start with a good baguette or loaf of Italian bread (I got this loaf from the newly opened Talula’s in Asbury Park). Slice it in half lengthwise, give it a light toast, rub it lightly with some raw garlic (like the technique used here and here), then spread on some ripe avocado and top with a sprinkling of sea salt. Set it aside. 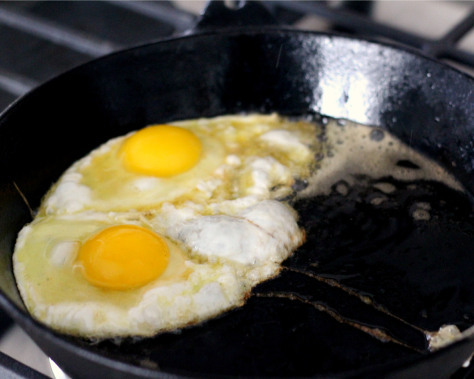 Next fry an egg sunny side up in olive oil, or however you like to do it. I’m into eggs fried Spanish style, in a super hot pan basted with oil so the whites get crispy and the yolks just barely tempered -hit them with some salt and pepper. 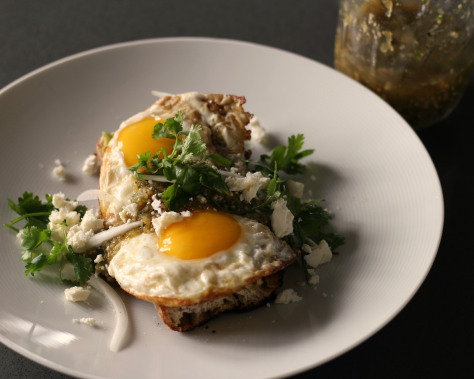 Use a spatula to transfer the eggs over to the avocado toast, then spoon salsa generously over the top. 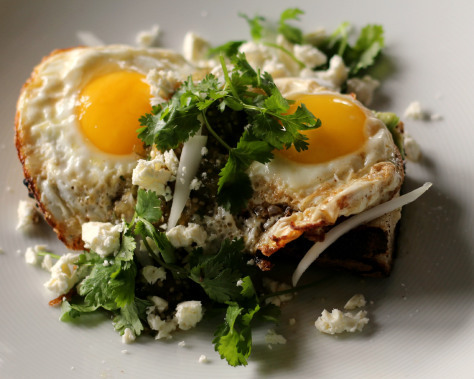 Finish with a crumbling of feta or queso fresco, some sliced onions and cilantro. 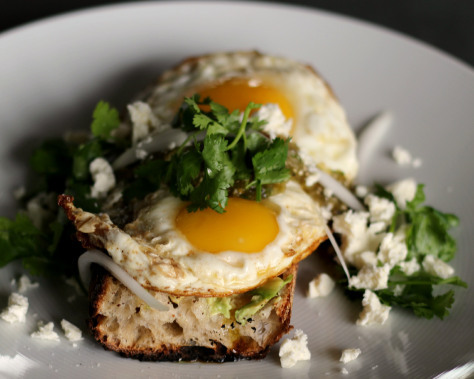 Perfect for breakfast, lunch or dinner. Congrats on everything else, though! Thanks! But seriously?! Runny egg yolks are the bessssstt!! Oh, lordy. Having just gone through the whole gutted kitchen thing last year – I feel your joy of nearing completion. It is a dream come true but I hope that you did not make the same mistake that I did when I failed to install a commercial venting system. Learning to cook in a restaurant means that I cook hard. I’ve been known to warp Calphalon saute pans. It would have been well worth the additional 2 grand. I hear you! I do the same thing, but we took it easy this time around because we don’t plan on being here forever (or even close to that). It’s all good enough without being over the top. When we settle into our “forever” home and I can design my “forever” kitchen, it will be an entirely different story. Just having gone through this process, there are already things I would do different in the future. Its a great learning experience for future kitchen designs! I love this story! When we were still dating, my hubnsad used to make me Thai green curry. Except that it was so spicy it was pretty much inedible instead of using 2-3 TBS, he would put in the entire can of green curry paste. Yikes! It took me a while (read: a couple years) to convince him there was a better way to make green curry. “a dollop” hehehehe. Also, I want that open face egg sandwich in my normal face.